Check out this Philadelphia Engagement Session. We took engagement pictures at Spruce Street Harbor Park on Columbus Blvd in the middle of a rain storm at taking photos on the Ben Franklin Bridge. I love taking engagement pictures after dark. This is a time when you get to show off a different side of each couple. This tattooed couple didn't mind the pouring rain. Since our camera gear is weather sealed (but not water proof) I wasn't worried about the rain. 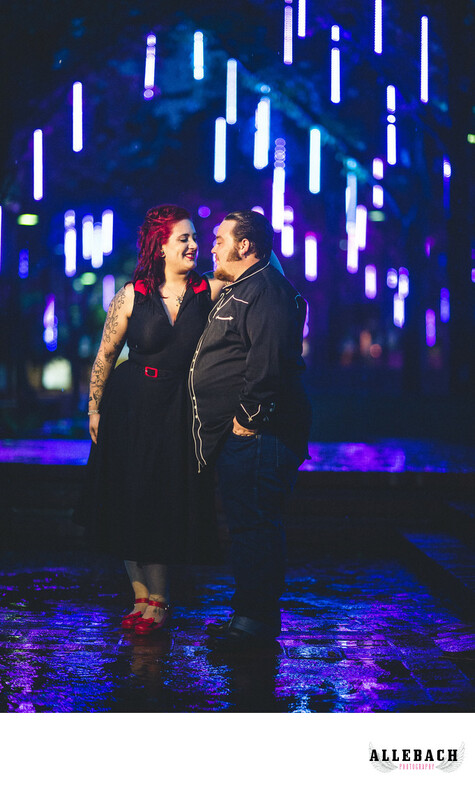 The beautiful reflection in the puddles of water perfectly complemented the bright colorful lights of this rockabily engagement.